It's rather surprising to me that so far the review with the largest number of hits has been the Dunville's VR 10 year old PX cask finish single malt. It's the most read by some margin too. I suppose I'm surprised in that it isn't necessarily the biggest brand in Irish whiskey, but I'm also happy that one of the smaller brands is generating that much interest. Echlinville Distillery who produce the Dunville's brand are probably now considered one of the elder statesmen of the Irish whiskey revival since beginning production in 2013, recently celebrating 5 years since they laid their first spirits down. At the Whiskey Social Belfast I got to try Echlinville's very own pot still whiskey, which although young shows great promise and was comparable to the Dingle pot still first release. Thankfully though the guys at Echlinville are taking their time as regards releasing their own whiskies, there will be no 3 year old's rushed out the door here. This is something I can only applaud with other Irish producers happily putting out very young whiskey at sometimes mind boggling prices. The Three Crowns then is one of two blends currently offered by Echlinville. 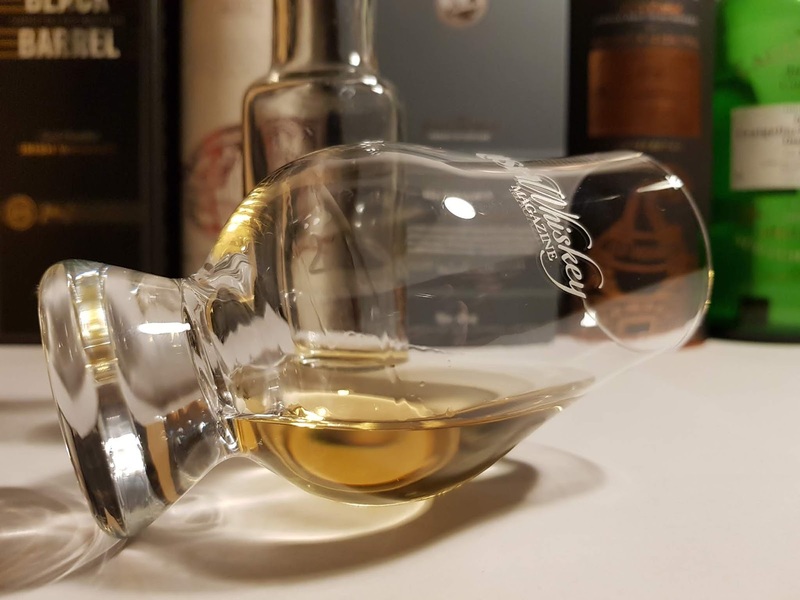 The second offering is the Three Crowns Peated which takes the standard Three Crowns blend and adds further maturation via casks that previously held whisky from Islay. Again, having tried it at Whiskey Social Belfast I thought it was pretty decent but a bit pricey at £45 a bottle. Interestingly when originally sold the Three Crowns was actually older than the VR and had a higher sherry component in the make up. This was taken from the Newsletter of Thursday 23 June 1921: "V.R." 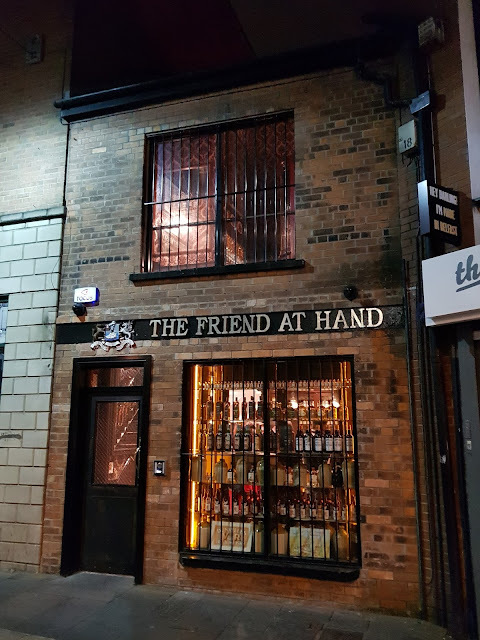 was drunk by rich and poor, and was pre-eminently the whisky of the great and brilliant Victorian age – a distinction it holds even at the present day. The firm's "Three Crowns" brand – described as a special liqueur whisky – differs from the "V.R." article chiefly in the matter of its greater age, and to a certain extent in the manner of its maturing, rather more sherry casks being used in the case of the "Three Crowns" brand. 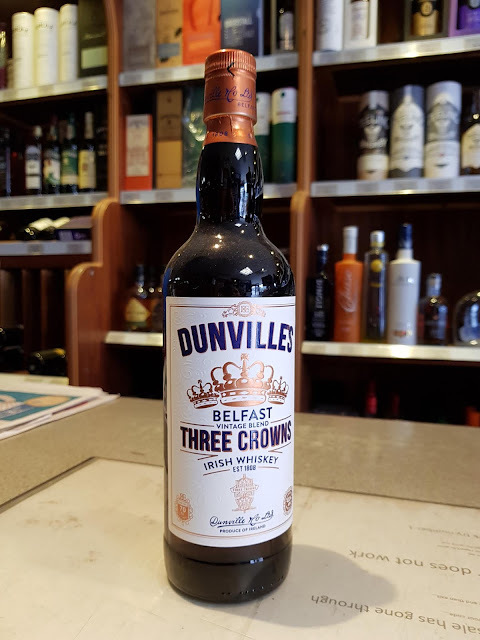 Today the Three Crowns is a blend made up of 4 year old single grain, 10 year old single malt and oloroso sherry finished 15 year old single malt and is bottled at 43.5% abv. A bottle will cost you £44.95 at Fairleys Wines in Coleraine where I took the lead picture, which incidentally is the same price as Master of Malt. Sainsburys in Coleraine currently sell in for £35 though. Since this has been released I had heard all kinds of good stuff about it and was pretty keen to try it. This sample was provided by my good friend Jason (who is a secret lover of Red Bush!). Straight away there was a dry sawdust attack to the nose - white pepper and slightly leathery. Then lots of young grain floral notes, appleade, tinned pears and furniture polish. Water brought some honey and Cadburys Tiffin. Really not a lot going on here - a dry spiciness, not overly fruity. The apples and pears of the nose struggling to make an appearance. Not much sweetness or nuttiness from the sherried component either. It's very much about the floral young grain and as such its just a bit bland. Water brings a little more sweetness to proceddings. Very short, dry and oaky. Sadly, a real let down and it doesn't live up to past glories. Just a totally bland and uninspired blend and depending on what you pay about £15 to £25 to expensive. 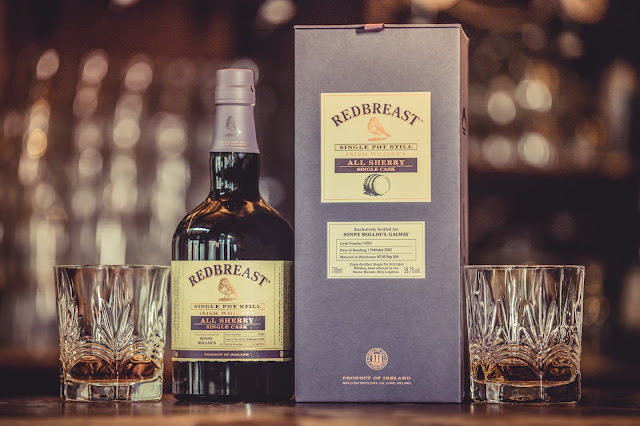 £45 takes you into Redbreast 12 territory. For £45 you could buy a bottle of Black Bush and Powers Gold, two bottles that offer substantially more flavour too. Not one I would recommend I'm afraid, nor one I will revisit anytime soon. This is an example of what is wrong with some of the new irish whiskeys. Overpriced and not great taste. I was left feeling a bit ripped off. They may have robbed me once but unlike great blends like Black Bush (definitely not Red) this will not be a repeat purchase. In fact, i will avoid all further releases from Dunvilles until we get some of their own spirit. However, i expect they will be pricing it with a very large mark up on what it is generally worth if this is anything to go by!